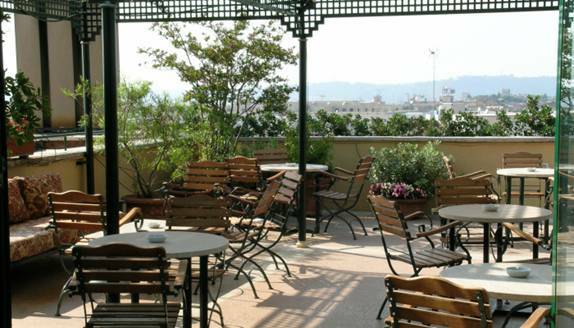 La Terrazza, Hotel Capo D'Africa, 54 via Capo d'Africa, Rome 00184. 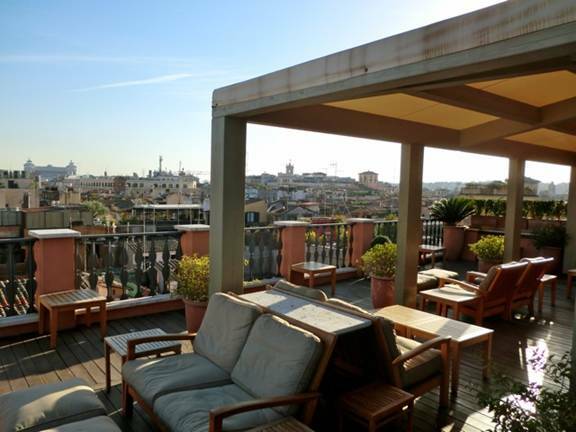 +39 06 77 2801 Lovely rooftop terrace which looks out over Ancient Rome. Panoramic views of the Colosseum and city's bell towers. Guests only. Open Colonna Roofterrace, Palazzo delle Espoizioni, 9a Via Milano, Rome 00184. +39 06 4782 2641 This upper level has its own terrace, including a vegetable garden. Ristorante La Mantia, Hotel Majestic, 50 Via Vittorio Veneto, Rome 00187. +39 06 42 1441. +39 06 42 14 4715 Terrace dining. 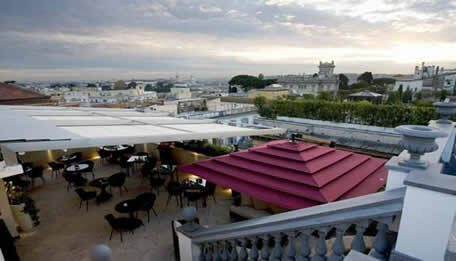 Roof Garden, Grand Hotel Via Veneto, 155 Via Vittorio Veneto, Roma 00187. +39 06 48 7881 Make requests for food on ground floor. Roof Garden Ailanto, Marriott Grand Hotel Flora, 199 Via Vittorio Veneto, Rome 00187. +39 046 9195 1216. +39 06 48 9929 Events only (and breakfast). 7 Heaven, Hotel Boscolo Aleph, 15 Via di San Basilio, Rome 00185. +39 06 422 901 Sister hotel to the Exedra Hotel. Hotel Eliseo Roof Terrace, 6th floor, Hotel Eliseo, 30 Via di Porta Pinciana (off Via Vittorio Veneto), Roma 00187. +39 06 487 0456. +39 06 482 8658. 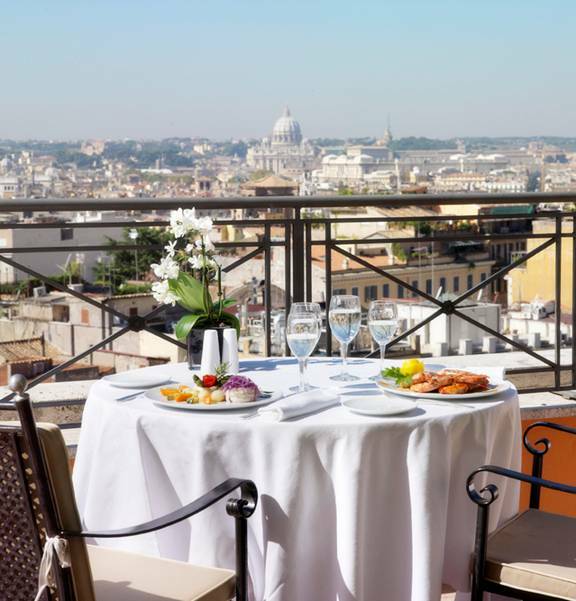 Rooftop breakfast room with magnificent views over the Borghese Gardens towards St. Peter's and the Vatican. Beautiful panoramic terrace. Terrace La Limonaia, Hotel Splendide Royal, 14 Via di Porta Pinciana, (near Via Vittorio Veneto), Rome 00187. +39 06 42 1689. Open for breakfast (from 7am to 10.30am) for lunch and private dinner (on request). American Bar Mirabelle, Hotel Splendide Royal, 14 Via di Porta Pinciana, Rome 00187. +39 06 42 1689. Open from 12 noon until 1am with tables inside and on the terrace. Il Giardino dell'Eden, Hotel Eden, 49 Via Ludovisi, Rome 00187. +39 06 478 121. +39 06 47 8121. 10.30am-1am. 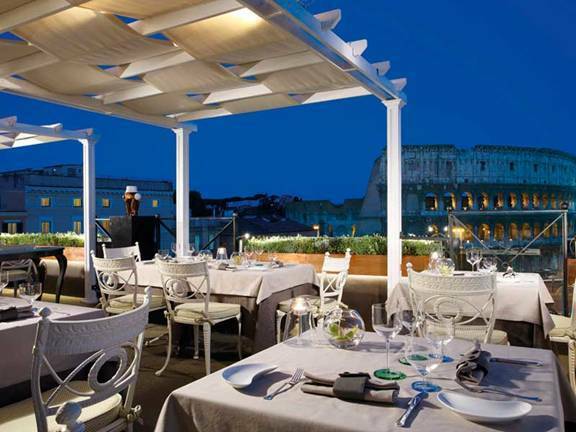 Roof Garden Restaurant at the Savoy Hotel, 15 Via Ludovisi, Rome 00187. Rooftop restaurant. +39 06 42 1551. Bar is on the next floor up. 12.30pm-2.30pm and 7.30pm-10.30pm. Rooftop Bar at the Savoy Hotel, 15 Via Ludovisi, Rome 00187. +39 06 42 1551. Great view as here seen from the bar. 11am till late night. Roof Garden at Hotel Villa Pinciana, 9/11 Via Abruzzi Rome 00187. +39 06 9604 2921. Small roofgarden that serves drinks upon request. A Leonardi Hotel. 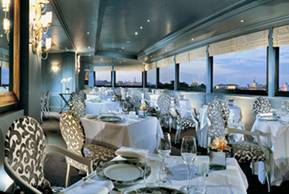 Panorama Room Restaurant, Marcella Royal Hotel, 106 Via Flavia, Rome 00187. +39 06 4201 4591. Rooftop terrace restaurant with stunning views. Jupiter Bar, Hotel Mozart, 23b Via dei Greci, Rome 00187. +39 06 3600 1915. Panoramic roof garden with bar. 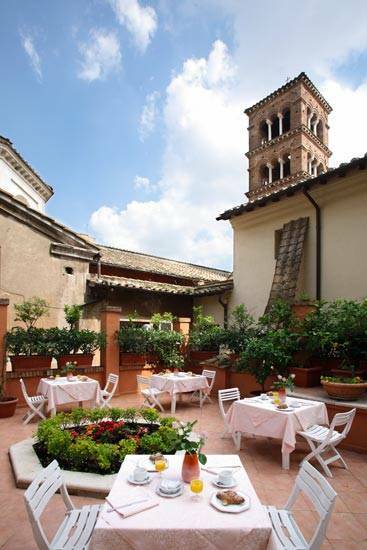 Roofgarden of the Portrait Suites Hotel, 7th floor, 23 Via Bocca di Leone, Rome 00187. +39 06 6938 0742. Owned by the Ferragamo family (famous shoe brand). Right off No.1 shopping street in Rome, i.e. Via Condotti. Continental breakfast on terrace. Best view on the Spanish steps. 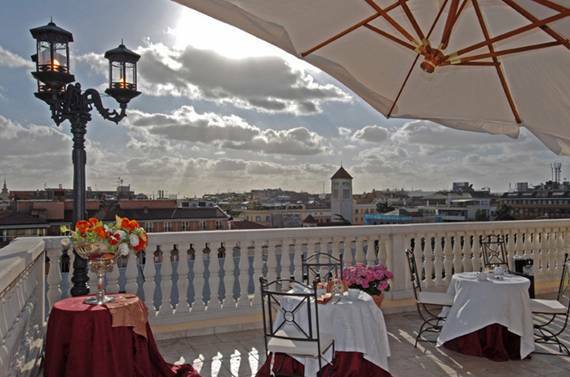 Terrazza at the Grand Hotel Plaza, 126 Via del Corso, Rome Lazio 00186. +39 06 6992 1111. Largest and most spread out roof garden in Rome with covered and open-air area. Only aperitivo bar in the summer. No restaurant. 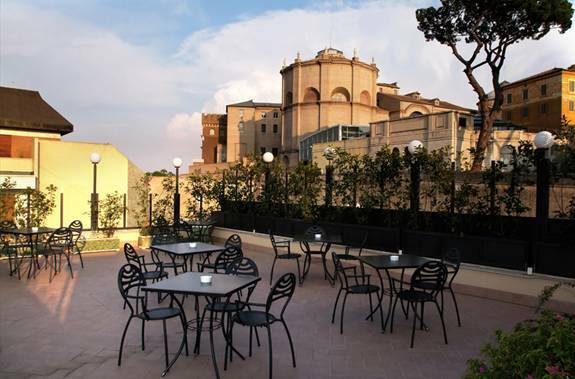 Roof Terrace at Hotel del Corso, 79 Via del Corso, Rome 00186. +39 06 3600 6233. Breakfast in summer only. 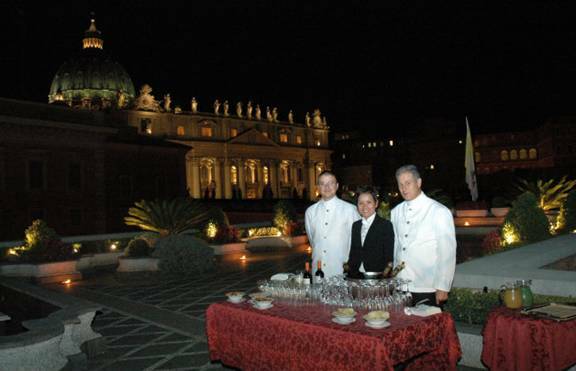 Roof Terrace of Hotel Sistina, 136 Via Sistina, Rome 00187. +39 06 474 4176. A Leonardi Hotel. 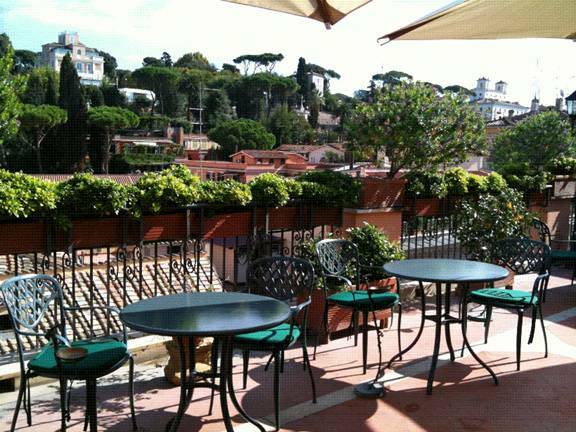 Roof Terrace at Hotel Concordia, 14 Via di Capo le Case, Rome 00187. +39 06 679 1953. +39 06 679 5693. 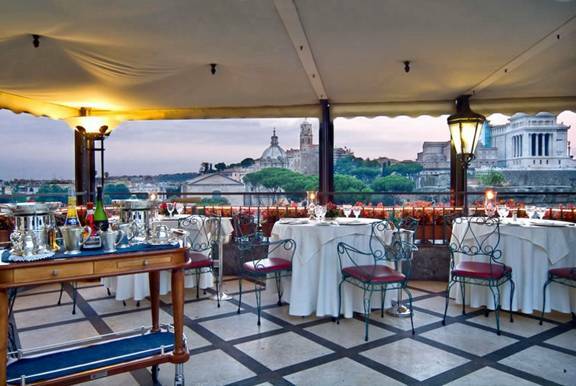 Rooftop Restaurant at Colonna Palace, 12 Piazza di Montecitorio, Rome 00186. +39 06 678 13 41. Spectacular Roof Garden which offers a unique and breathtaking view of the old town. Hi Res and Tarter Bar, 6th floor, Hotel Valadier, 15 Via della Fontanella, Rome 00187. +39 06 361 1998. 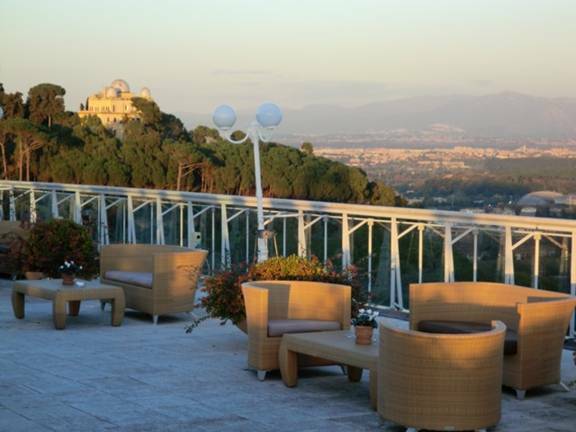 Offers a breathtaking and enchanting view over the rooftops, domes and terraces of the Eternal City. 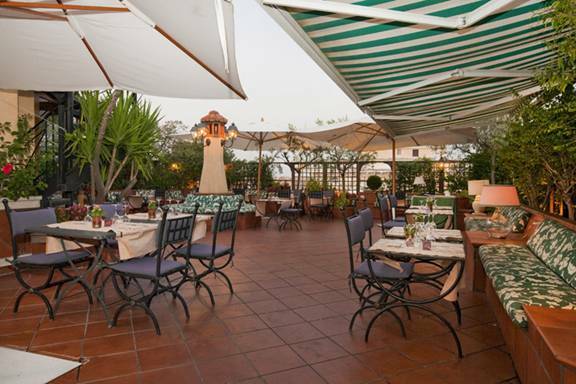 The large terrace is covered in winter and open in summer and offers traditional Roman cuisine and fusion and ethnic inspired variations, with a Tartar Bar and Wok & Grill Corner. La Terrazza sulla Luna. Rooftop Lounge at Fontana Hotel, 96 Piazza di Trevi, Rome 00187. +39 06 678 6113. Trevi Fountains. Roof Terrace at Relais Fontana Di Trevi, 44 Via Del Lavatore, Trevi fountain Rome 00187. +39 06 679 7317. Roofgarden at La Minerva, Grand Hotel de la Minerve, 69 Piazza della Minerva, Rome 00186. +39 06 69 5201. Literally a stone’s throw from the vast dome of the Pantheon, this rooftop restaurant has a magical atmosphere on a summer’s evening. +39 06 6952 0169. 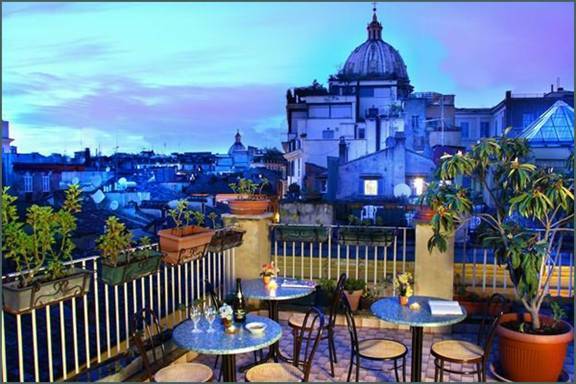 Roof Terrace at Hotel Genio, 28 Via G. Zanardelli, Rome 00186. +39 06 683 3781. Lovely terrace for sunbathing and aperitivo in the afternoon. Commanding views. A Leonardi Hotel. Rooftop Lounge Bar, St George Hotel, 62 Via Giulia, Roma 00186, Italy. +39 06 68 6611. Open June until September. Restaurant: 7pm-10.30pm. Bar: 7pm-12.30am. Thurs to Sat. Closed in bad weather. Caffeteria/Bar Italia, Via di San Pietro in Carcere, Vittoriano Monument, Rome 00186. +39 06 678 0664. 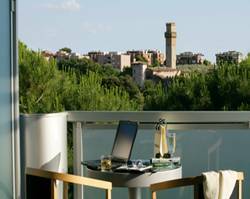 Overlooks the Trajan Market and view to the Roman Forum and Colosseum. 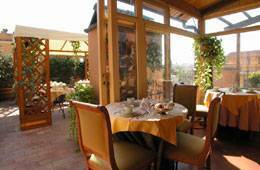 Roof Garden of the Hotel Regno, 330 Via del Corso, Rome 00186. +39 06 697 6361. ROOF GARDEN, The First Hotel, 14 Via del Vantaggio, Rome 00186. +39 06 4561 7070 360-degree views of the historic center of Rome, including Villa Medici and its surrounding gardens to the east. Roof Terrace, Villa Spalletti Trivelli, 4 Via Pacienza, Rome 00184. +39 06 4890 7934 Up the hill from the Piazza Venezia area you will find this hidden 5-star plus gem with only 12 rooms and a great spa for wellness. It feels like being in a private noble mansion, which is what this originally was. The Terrazza is on the rooftop on the third floor. In the summer you can have your apperitivo there. Roofgarden at The Hotel Isa, 39 Via Cicerone, Rome 00193. +39 06 321 2610. A Boutique Hotel, recently renovated, located close to Castel Sant' Angelo, Ara Pacis, and between the Spanish Steps and the Vatican. 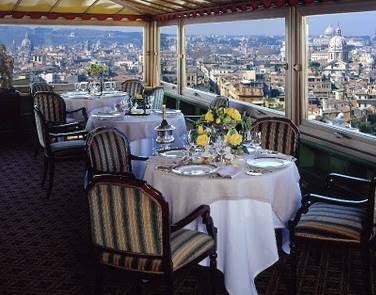 The terrace of the Isa Hotel of Rome enjoys an exceptional view on the nearby Vatican City and the splendid Cupola of Saint Peter. Every evening there is a small buffet as well as excellent cocktails and drinks. No Lunch. 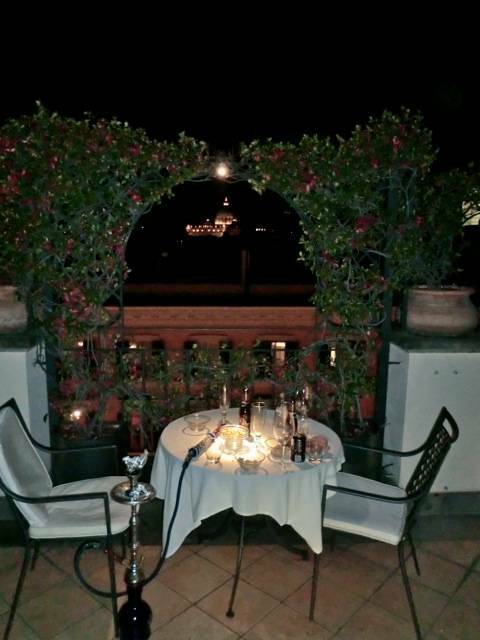 Roof Terrace at the Visconti Palace Hotel, 37 Via Federico Cesi, Rome 00193, Italy. +39 06 36841. Basilica rooftop coffee bar, St Peter's Basilica. Little known and accessible only to tourists who have already paid to go up to the dome. It is fairly rudimentary. The cafe is indoors and has no view of the skyline. No telephone. No reservations. Roof Terrace at Hotel Alimandi Vaticano, 8 Via Tunisi, Rome 00192. +39 06 3972 3948. 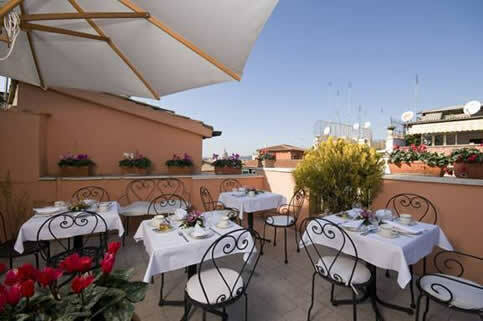 Roof Terrace at Hotel Donna Camilla Savelli, 27 Via Garibaldi, Rome 00153. +39 06 588 861. Fantastic view from the rooftop but it is for Events only. Former monastery converted into hotel. Breakfast on a gorgeous patio. Roof Terrace, Columbia Hotel, 15 Via del Viminale, Rome 00184. +39 06 488 3509. Roof Garden. La Terrazza, 7th floor, Hotel Nord Nuova Roma, 3 Via Giovanni Amendola, Rome 00185. +39 06 488 5441. 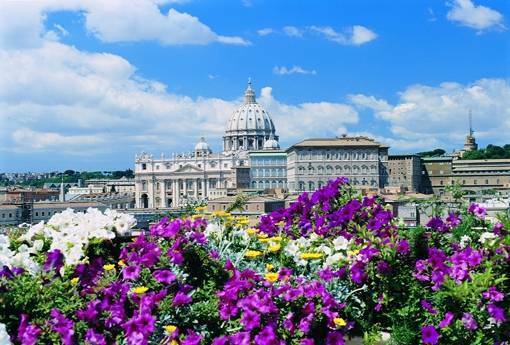 Offers a magnificent view of Saint Peter's Basilica and the Vatican. Open during the warmer months from 2pm to midnight. 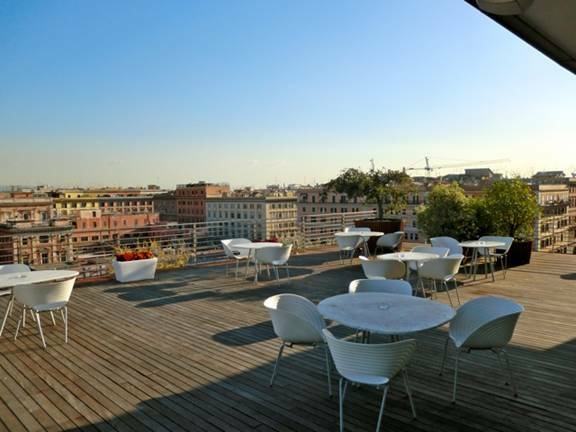 Roof Garden, 10th floor, La Griffe Hotel, 13 Via Nazionale, Lazio, Rome 00184. +39 06 4782 9885. 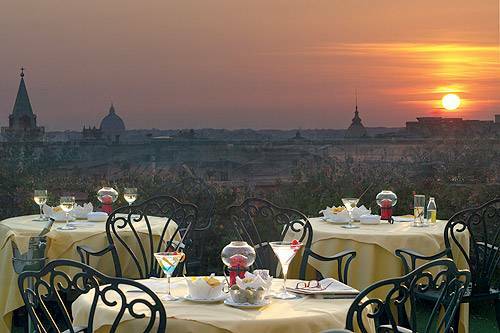 Large roof garden with spectacular views of the city so what better way to wind down after visiting the sights of Rome than an aperitif in the most relaxing atmosphere possible. Close to Rome's train station, Stazione Termini. Hotel Borromeo, 117 Via Cavour, Rome 00184. +39 06 48 5856. +39 6 488 4915. Rooftop garden, an area specifically meant for the buffet breakfast. Roof Terrace at Hotel Artemide, 22 Via Nazionale, Rome 00184. +39 06 48 9911. 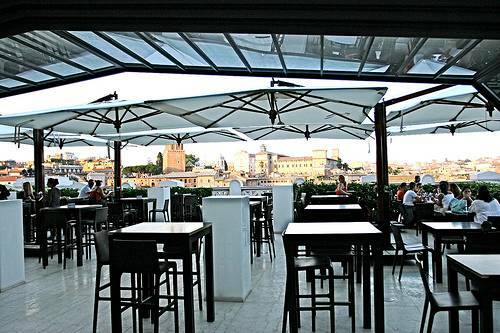 Roof Bar Terrace, 10th floor, Hotel Mediterraneo, 15 Via Cavour, Rome 00184. +39 06 488 4051. In a Roof Garden this Bar offers extraordinary panoramic view of the city. Al fresco lunching and dining from Spring to early Autumn. Bettoja Hotel Mediterraneo. 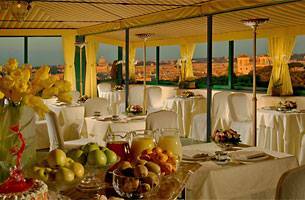 L'Uliveto Roof Garden, Hotel Diana, 4 Via Principe Amedeo, Rome 00185. +39 06 47 8681. Enjoy the view of the Altare della Patria, (Monument to the Unknown Soldier in Piazza Venezia), the Quirinale Palace, the Basilica of Santa Maria Maggiore and St Peter's Dome above Rome's rooftops. 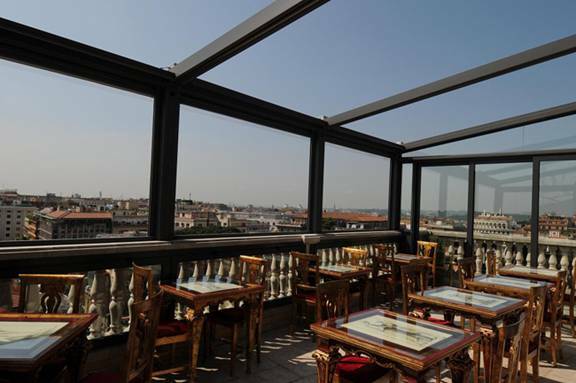 Sunroof Terrace of Hotel Rex, 149 Via Torino, Rome 00184. +39 06 482 4828. 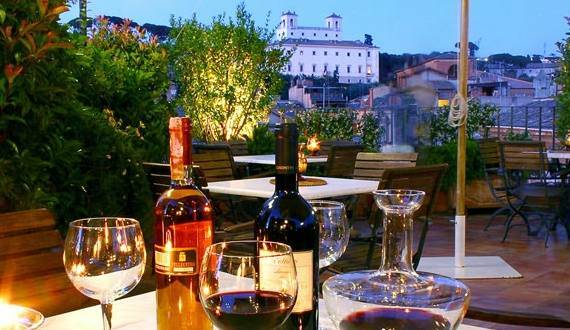 The Rex Hotel is a gateway to Monti, the nightlife quarter. Near the Opera House and the National Art Gallery. 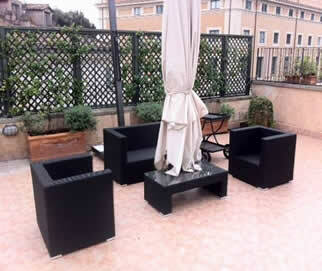 Roof Terrace at Hotel Daniela, 31 Via Luzzatti, (San Giovanni), Rome 00185. +39 06 702 7817. A Leonardi Hotel. Palazzo Montemartini Roofterrace, 20 Largo Giovanni Montemartini, Rome. +39 06 645661 Near train station Roma. 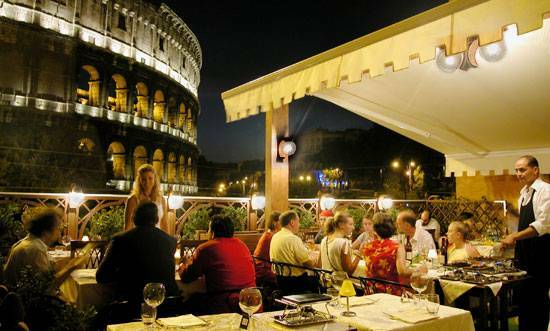 Ristorante The View, 200 Via Trionfale, Rome 00196. +39 06 3540 2631. Roof Garden, 6th floor, Hotel dei Consoli, 2D Via Varrone, Rome Lazio 00193. +39 06 6889 2972. Rooftop Jacuzzi Bar at Cardinal Hotel, 71 Via Leone Dehon, Rome 00165. +39 06 63 2252. In a charming suburb of Rome's green belt.